OK, a couple of days ago the lady who runs the blog Little Bits of ran out of bread so she decided to cut up a sweet potato and toast that instead. It was enterprising, which I 100% respect, but what I’m deeply, deeply confused about is the absolutely bonkers response this got. Mindbodygreen covered this in November, and no one really cared about it back then, but this time around it was labeled game-changing, certified A Thing, and the expected parade of embedded Instagram roundups issued forth. Just look at this Google Trends spike! It was insanity. I had to try this for myself to see what all the hullabaloo was about. 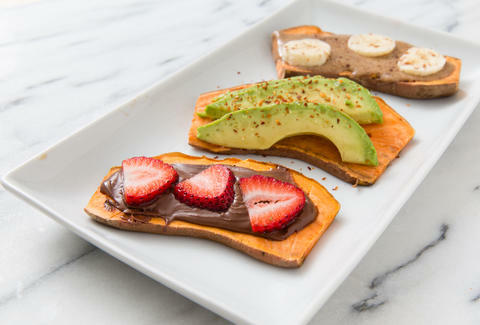 Here’s how you make sweet potato toast, according to the Internet: slice sweet potatoes lengthwise, and then toast the slices, TWICE. That last bit is important, otherwise the potato won’t cook through. Admittedly, I’m a big, big fan of sweet potatoes and any way to cut down the usual 40 minutes of oven bake time sounds perfectly peachy to me, so I was actually kind of hoping this worked. My toaster goes to 7, which is completely irrelevant unless you have the same model of toaster as I do, but know that I had to cook mine three times to get it anywhere near edible. And you know what? It worked, and it was... fine. I ate it with avocado and it tasted like any other time I’ve eaten avocado and sweet potato, which is frequently. The flavors and textures are very complementary. But this isn’t the point!! This is just another misguided toast trend, and I’m not having it. Don’t get confused, I’m bread toast’s biggest fan. It’s just that as such I really resent the fact that I now have to refer to “toast,” which is defined by Wikipedia as “sliced bread browned on both sides by exposure to radiant heat” as “bread toast” because the original word’s been completely bastardized by the proliferation of various takes on it throughout the last two years or so. “Toast” is a concept more than anything now, with fancy restaurants offering up expensive, lavish variations and fancy people selling us their recipes. Recipes. For toast. Think about that! I’m far from the first person to call out the trend that is elevated, artisanal toast, and there’s no doubt that all these bougie menu and recipe toasts are delicious. The problem is that they’re not toasts, they’re sandwiches. More specifically, open-faced sandwiches, or if we want to be classy about it, tartines, terms which are both defined as being a single slice of bread with stuff on top. Which brings me back to the topic at hand; if you wanna eat sweet potatoes with almond butter, fine. Just don’t call it toast. Carrie Dennis is a Food & Drink editor for Thrillist and is tremendously passionate about toast. Follow her on Twitter: @CarrrieDennnis.